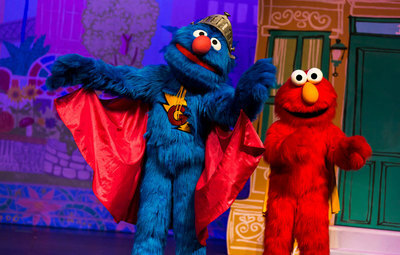 Sesame Street Presents Elmo's Super Fun Hero Show is a delight for young theatre goers. The theme, as you would imagine, is superheroes but not in the traditional 'cape and muscles' sense. All the usual Sesame Street crew, Cookie Monster, Grover, Abby Cadabby, Zoe and of course Elmo are on a mission to find their super power and also to discover that of the host of the show, Super Sparkleheart. As the show progresses, your little ones are encouraged to participate in the mission with a little song and dance along the way. Favourite songs include the delightful Belly Breathe and Elmo’s Ducks. The crew meet Big Bird and The Count who need help from their 'superhero' Sesame Street friends. The sweet message that is delivered to young audience members is that all of us, including Elmo and his friends, possess the 'super' power of kindness and compassion, and must use it to help others. The stage show is an hour long, just the right amount of time for the attention of a toddler or pre-schooler. Of all the pre-school TV-show-turned-stage-shows out there, Sesame Street Presents Elmo's Super Fun Hero Show is a good one. Sesame Street Presents Elmo's Super Fun Hero Show doesn't stop in Melbourne, but instead moves on to Sydney, Newcastle, the Gold Coast, Brisbane, Canberra, Adelaide, Mandurah, and Perth over the coming month.